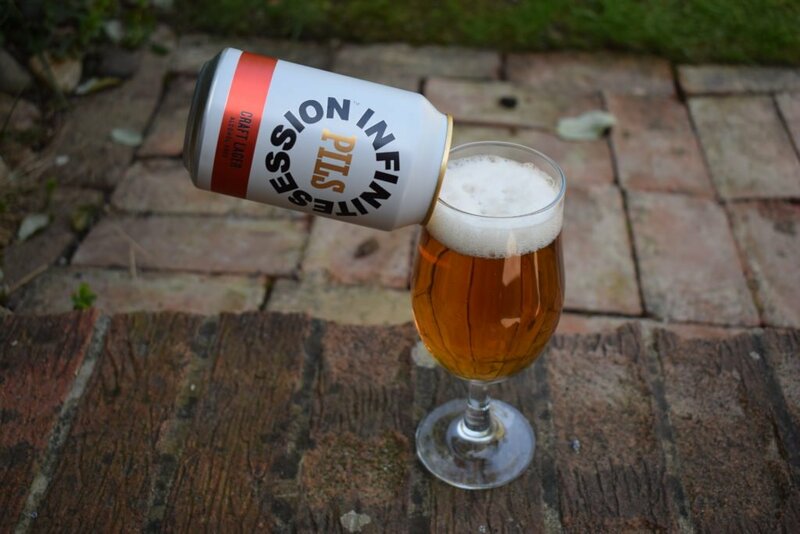 Infinite Session “Pils” is the brewery’s dry-hopped alcohol-free lager offering. Get tasting notes and nutritional info in this review. If you thought the recent boom in breweries producing real ale and craft beer would chip away at lager’s market share, you’d be wrong. In 2017, lagers accounted for 75% of beer sales, up from a tiny 7% in 1970. Yet, this doesn’t mean there’s lots to celebrate in the boardrooms of the biggest lager producers like Budweiser, Stella Artois, Carling, Heineken and Carlsberg. Overall sales of beer are down and many consumers, craving quality products, are shunning mass-produced lager and instead spending their cash with smaller producers. Now, with the popularity of alcohol-free drinks on the rise, the big beer corps are offsetting some of their losses with a range of alcohol-free lagers. However, they’re not going to get it all their own way here either. Those pesky smaller producers, driven by passion rather than profit warnings, are ready to nip in to steal some of their customers. One of these producers is Infinite Session, a one-year-old “cuckoo” brewery that already has good form in the alcohol-free beer market with an American pale ale and a IPA. Now it’s going for Stella et al with a non-alcoholic pilsner lager, simply titled “Pils”. 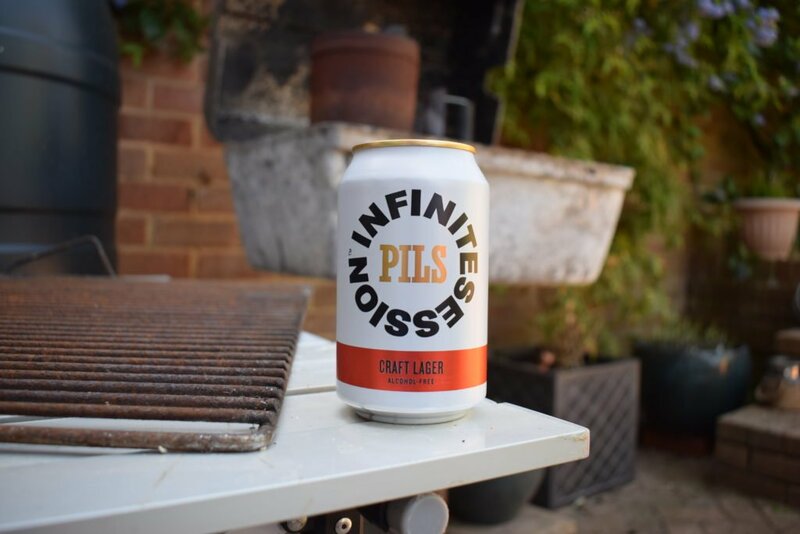 Like Infinite Session’s other creations, Pils comes in at 0.5% ABV. Unlike its bottled pale ale, there’s no lactose in the ingredients making it suitable for a vegan diet. The grains alongside malted barley are wheat and oats. As with Pistonhead’s non-alcoholic “Flat Tire“, Infinite Session dry hop this lager and this is evident in the aroma as soon as you crack it open. As well as caramel and a sterile yet surprisingly pleasant root beer smell, there’s a pine aroma from the hops. Smoother than most would expect from a lager, Pils is highly carbonated and has a decent, medium body. It pours clear amber and foams up nicely to leave a modest head. A sweet fruitiness is the main theme in the flavour with tropical fruits backed by a caramel maltiness. It feels like the fruitiness comes from the yeast rather than the hops. Instead, hops provide just enough bitterness to balance out the fruit flavours. The flavours fade quickly leaving a dry aftertaste. 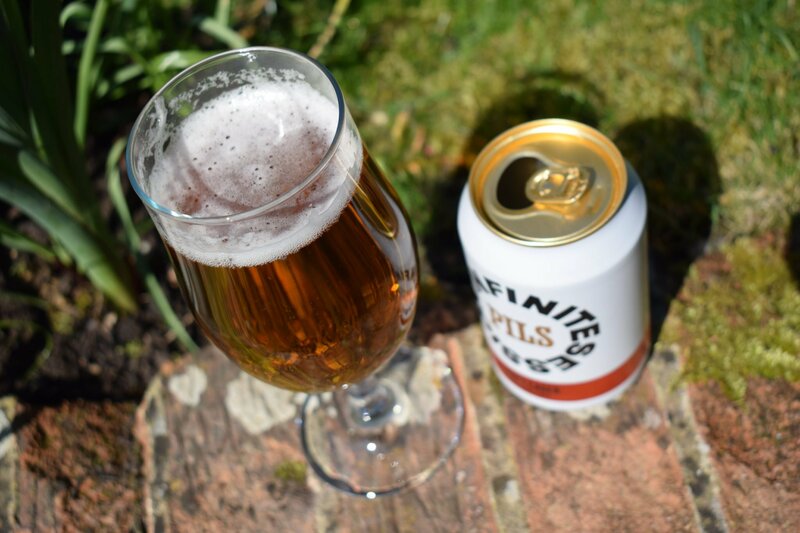 Exhibiting a few flavours and aromas you might not expect in a pilsner, Infinite Session’s Pils might disappoint if you’re after an archetypal lager. But if you’re after an interesting beer to add to your alcohol-free menu, it’s worth a shot – even if you’re usually an ale drinker. My only qualm was how the flavours quickly disappeared near the end of each sip.